Continued from Stage 23 - page 1. Walk through the village and walk past the lavadero, this is where people used to go and wash their clothes in the days before washing machines. After a while you will come to a road at which point you will need to cross both it and the canal close by. After about 200 metres you will need to turn left and then walk about 1 kilometre before rejoining the road and entering the village of Santibañez de Valdeiglesias. There is a reasonably sized albergue here with a kitchen. The village does have a café but they don't serve food, they do however sell food items as they are the local village shop. 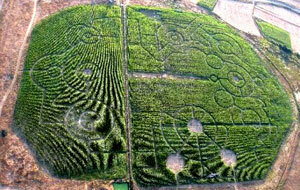 The village is small but each year they construct a maze out of maize which is reputed to be the biggest in the world. Walk directly through the village and take a right up Calle Carromonto Alto. You will start walking up hill and into open countryside. From the top of the hill the path descends into a valley where the way markers can be found on the ground. Walk up the other side of the valley and then down again into the next valley and yes, you've guessed it, start walking uphill again onto an open plateau. Soon after you come to the Crucero de Santo Toribio where the two routes meet. From the Crucero you get, on a good day, some fabulous views of Astorga in the valley below. From here walk downhill taking a right turn onto the old road which links to the new main road and into San Justo de la Vega. This is a village that is continuously expanding and has a number of bars, restaurants and a shop. Accommodation can be found at a hostal or at the local casa rural. The village also allows people to camp by the river during the summer months. Walk through the village and cross the bridge over the Río Tuerto. Take a right turn 100 metres later walking past the merendero, a picnic area. Keep following the road until you come to a bridge with 3 arches across a canal. Cross over it and take a left down a track towards the main road. After a short while you will cross the railway tracks a couple of times using the marked level crossings and then enter the walled city of Astorga through the Puerta del Sol, making your way to the Plaza de la Catedral. 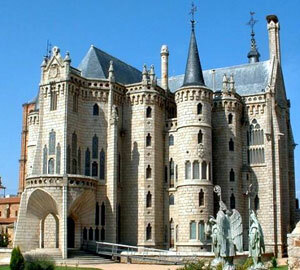 Before the Romans arrived Astorga was home to the celtic Astur tribe. The region was then conquered by the Roman legion Legio X Gemina. The Romans made it one of their most important forts due to the number of roads passing through the district and more importantly, the sites of many gold mines in the area. The Romans named the town Asturica Augusta. In recent centuries the area around Astorga became the capital of the Maragatos, an ethnic group of people known for their very distinctive dress, customs and building style. During the height of the Camino de Santiago in the Middle Ages, Astorga boasted 22 pilgrim hospitals, the last of which, el Hospital de las Cincol Llaga, burned down early in the 20th century. 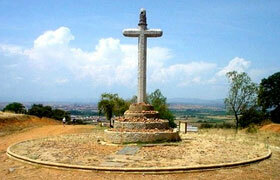 It is here that the Via de la Plata (the Silver route) meets up with the Camino Frances. There are a number of buildings worth visiting as you pass through. 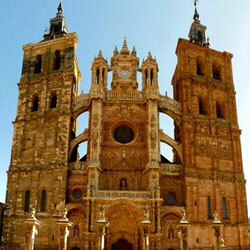 The first is the Catedral de Santa Maria. Building on the cathedral started in the 15th century under the auspices of Obispo Don Alvaro Osorio y Guzmán as part of a remodelling of the earlier Romanesque cathedral, parts of which can still be found within the current building. The building wasn't to be completed for further 300 years. 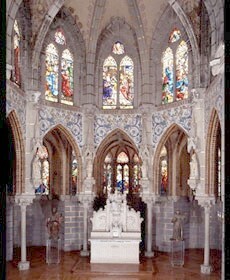 Most of the building is gothic in style, but the towers and the façade, added in the early 18th century, are Baroque. Just across the road from the Cathedral is our next building, the Palacio Episcopal, which despite its name has never been the home of any bishop, even serving as the local headquarters of General Franco's Falange party during the Spanish civil war. There has been a primitive style of Bishop's palace on this site since Doña Urraca donated the land to Bishop Don Pelayo in 1120 AD. The building was adapted in numerous ways over the intervening centuries but 2 months after the new Catalan Bishop Don Juan Bautista Grau y Vallespinós moved in it burnt to the ground. So a new palace needed to be built and the new Bishop called upon his very good friend and fellow Catalan Antoni Gaudi to design and build the new Episcopal Palace. Building started in June of 1889 but when the bishop died in 1893 only the first two floors had been completed with the third floor and the roof still to be finished. Following the death of his friend, Gaudi had a number of disagreements with members of the council and he resigned from the project therefore stopping construction for several years. It is even reported that so disgusted was Gaudi with his treatment that he said “he wouldn't cross Astorga even in a hot air balloon”. It wasn't until the arrival of the Asturian Bishop Julián de Diego y Alcolea in 1907 that work start anew on the building. In order to finish the building the bishop commissioned the architect Ricardo Garcia de Guereta who completed the building in 1915. The chapel was consecrated in 1913 but the next year Ricardo Garcia de Guereta, like Gaudi, resigned the contract and it wasn't until 1956 and the appointment of Bishop Castelltort did work to finish the interior restart with work finally being completed in 1961 under Bishop Gonzalez Martin who promptly converted the building into what it is now – el Museo de Los Caminos. If you are anything like me you will enjoy nothing better than having a lovely bar of chocolate as a treat after a long walk up hill and down dale (I live in Yorkshire) as a reward for all that hard work. For those of you with a sweet tooth there can't be anywhere better to visit than the Museo de Chocolate. 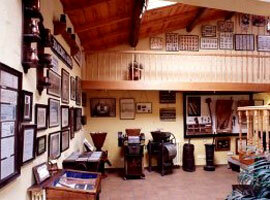 The museum celebrates Astorga's chocolate industry which thrived during the 18th and 19th centuries. The museum houses a unique collection of materials and machinery used in the making of chocolate from grinding stones through to the plates used in the printing the labels for the chocolate. You will be able to see how chocolate was and is being made and at the end of the tour sample the chocolate itself. My mouth is watering just thinking about it – enjoy. For those of you with an interest in Roman history you can visit the Museo Romano which has been built over the Ergástula cave which is believed to have been the entrance to the ancient Roman forum. 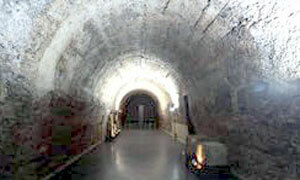 Inside you will find many objects found in archaeological digs in the area which show how the Romans lived and worked. Like many large towns Astorga has all the usual amenities. For accommodation you can choose one of the 2 large albergues or decide to stay at one of the 4 hostals.